Good news first. Payment for the highway in Slovakia is not increasing in 2015, at least for private cars. The next news is that the quality of highways remains the same. Miserable in many regions. And the highway net still not finished. 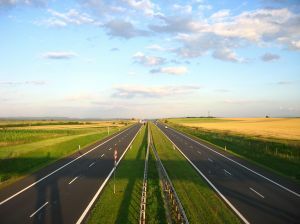 So how much will we pay for highways in Slovakia in 2015? For using highways and roads for motor vehicles on the area of Slovak republic with exception of parts marked with additional sign (crossed sticker) the capitation taxi s payed by buying and putting sticker on the front window of the vehicle. The sticker (vignette) is placed in the right side of the window in upper or lower corner. There are three different types of stickers available depending on the lenght of time you want to use the highway. The shortest is 10 days sticker. As it’s name says it is valid for 10 days including the day of buying, or more precisely marking. It costs 10 euros. The toll sticker with validity of 30 days costs 14 euros. If you plan to use it the whole month you are supposed to read notes on the back of the sticker. Therefore you can avoid paying penalty. The whole year toll sticker for 2015 costs 50 euros and it is valid since 1.1.2015 to 31.1.2016, which means 13 months. The same applies for last year sticker for 2014 which was valid to the end of january 2015. Some time ago the validity of highway sticker ended at midnight of 31.12. which causes many problems to many drivers. It seems like finally someone got some logic. The interesting part is that by contrast to 10 and 30 days stickers the whole year sticker is round shaped. Maybe the policemen finally start to use their brains when checking the stickers and they will not push cars into one coridor and to stop all the vehicles on the highway pit stop for checking wheather all the drivers have highway stickers and to collect some penalties. The rumors about acting this way used to be heard in radios or in television and people used to talk jokes about it too. Slovak highway stickers for 2015 can be bought on gas stations or in post offices. This entry was posted in Traffic and tagged toll. Bookmark the permalink.